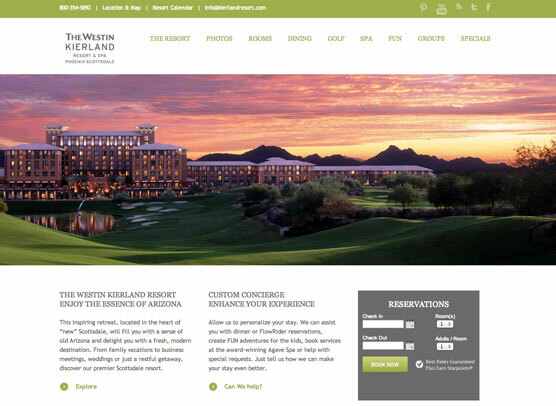 After several years of managing the online properties for The Westin Kierland Resort & Spa, etainia undertook a strategic review designed to condense and simplify the variety of content streams and requirements of their websites. A revised navigation schema, collapsing content, tabbed content and site-wide promotion integration allowed us to bring more content to the visitor in a more intuitive way. By structuring the site with special offers living in and internal “Specials” blog, flowing into a categorized “Special” pages (dining specials, etc.) and by featuring and managing their positions, the special offers have become woven into the site without overwhelming the visitor or guest. The site is responsive and mobile-friendly, optimized for search engines, streaming Twitter channels and promoting their Facebook and other social media channels. A custom booking widget was designed to connect to the Starwood booking engine, OpenTable is embedded in their primary dining venue pages and the Custom Concierge program originally developed by etainia continues to get strong positive response from guests. Etainia condensed their websites from five to three; primary resort site, Kierland FlowRider promotional site and their online store for Gift card and Spa product sales. The Epicurean e-newsletter and other email promotion campaigns are managed by etainia along with other digital marketing and media services as required.